What is it the science that we do? The RSSRG research activities encompass the whole process of quantitative remote sensing (essentially from satellites, yet airborne is also considered), i.e., understanding the physics underlying the signals measured by instruments orbiting around the Earth, developing the numerical inversion techniques (algorithms) to process these signals and then drive relevant “geophysical properties” from them and, finally, using these products to address questions about characteristics of, and changes in, our oceans and land environments from local to global scales. This description explains why the group has been sitting since its inception under the Physics department at Curtin University. Our approach indeed is quantitative, which means that we do not simply map properties (as in the Geographic Information Systems – GIS – arena) but we derive so-called geophysical quantities in SI units (e.g., bathymetry, absorption and scattering properties, phytoplankton or sediment concentrations, amount of carbon fixed through photosynthesis). 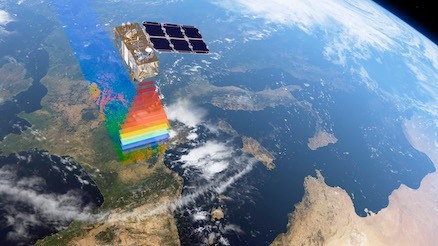 We work essentially in the domain of passive optical remote sensing, i.e., using signals from the near ultraviolet (UV) to the visible, the near infrared (IR) and the shortwave infrared (SWIR), as they are backscattered to space (hence to satellites) by the coupled land-ocean-atmosphere system. Among this generic description, our specific “niche” is the “ocean colour radiometry” (OCR), which is dedicated to quantifying optical and biological oceanic properties. The downstream applications that we develop are in the domains of oceanography (essentially around phytoplankton and the carbon fixation going through this crucial link of the marine food web), marine ecology (mapping and quantification of shallow waters habitats, seagrass etc..), land vegetation mapping and quantification, to name a few. —> How phytoplankton amounts & composition change in the coastal and open ocean, from seasonal to inter-annual and to decadal scales? —> How primary productivity (Carbon fixation) change according to changes in phytoplankton amounts and composition, and to changes in their physical environment? —> How do water quality & habitats change in coastal waters? —> How do these changes affect the higher trophic levels? As far as our marine-related activities are concerned, the geographical areas of interest to our current projects include the WA coastal waters, the Indian and Southern oceans, and the global oceans in some cases. Our land focus is on areas such as Australia’s wetlands and mangroves. Potential users of our research include the fisheries, agriculture, defence, environment agencies, international space agencies.